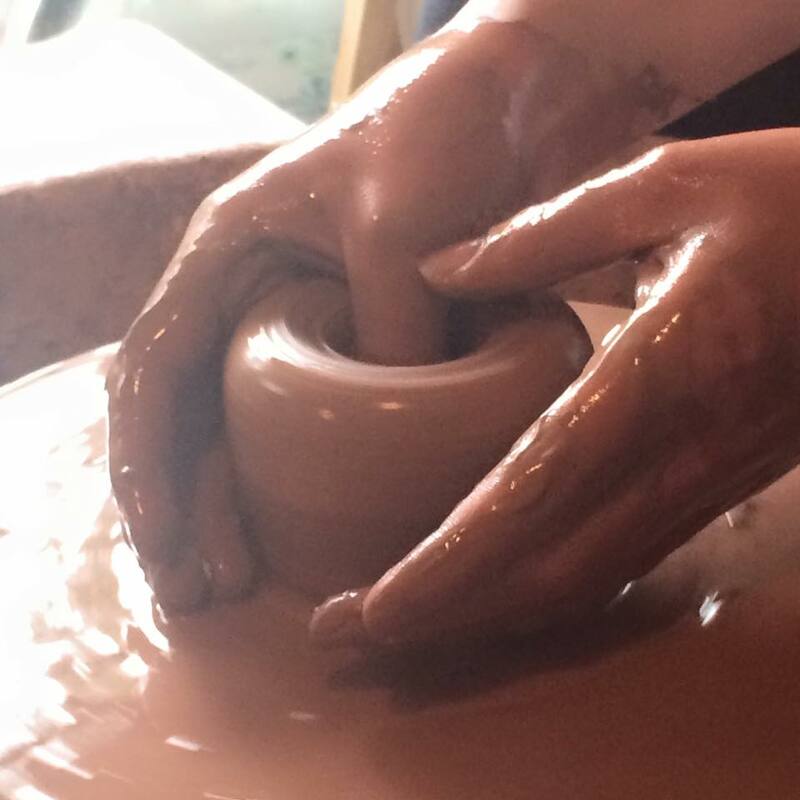 LDA’s Unique Journey, Grief and Loss, and Expressive Arts as a healing tool. 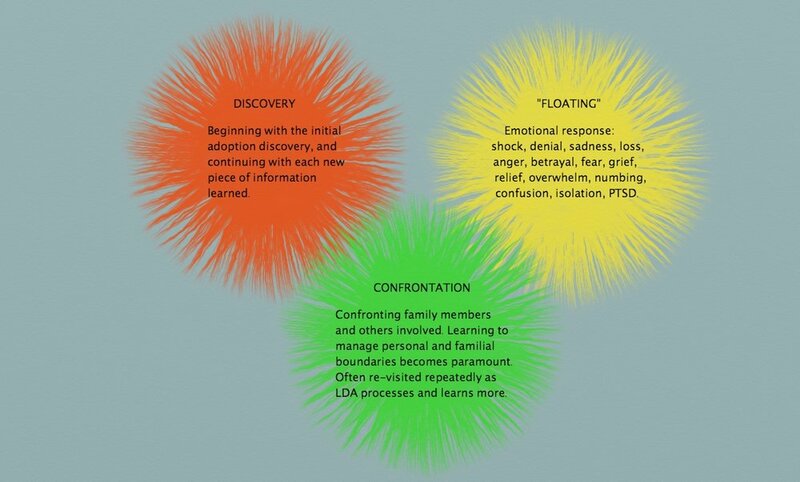 Below is a framework I've developed, based on conversations with LDA's and from my own experience. This maps the repetitive cycle of the LDA post discovery. 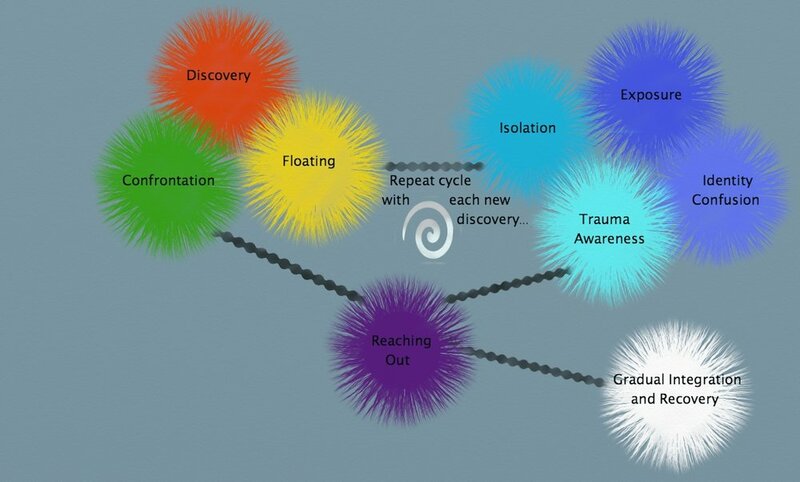 The journey begins with Discovery, Floating and Confrontation; followed by Isolation, Exposure, Identity Confusion, and Trauma Awareness; next is Reaching Out and Gradual Recovery and Integration. 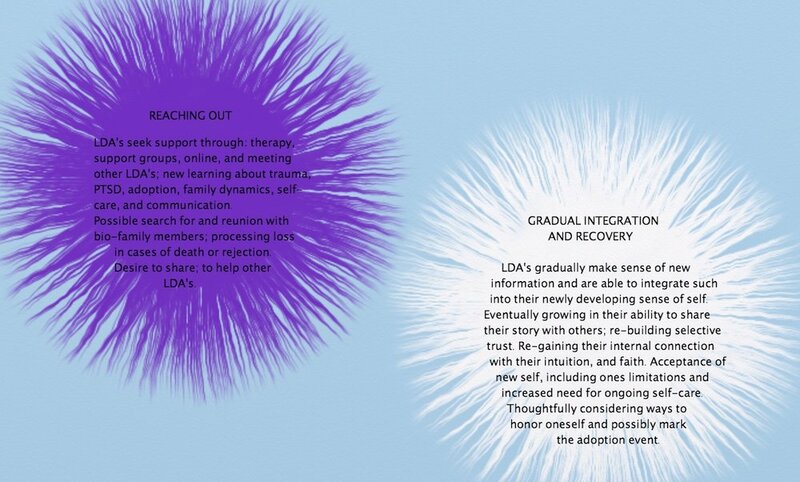 Many LDA's find that discovery affects all aspects of their internal and external world. For most, the initial discovery is just the first of many discoveries as they search to piece together their story. Many re-cycle through parts of this journey with each additional discovery along the way. Scroll down for a more detailed description of each stage. The following description of the Grief and Loss cycle will probably feel familiar for many of you. However, I have made it more applicable to the LDA journey. Please keep in mind this emotional process is not linear! Each individuals experience is unique to them. Many LDA's find themselves looping through these repeatedly, and in no particular order, or perhaps skipping some all together. I consider much of this emotional processing as a part of the "Floating" stage listed above, although overlapping happens at various stages. Many LDA's report some form of "Floating" upon each new discovery of information, and at each step as they go along. Shock and Denial: feeling as though nothing has changed, and everything has changed; shock, numbness, emotional avoidance; confusion, fear, relief, elation. Anger and Rage: surprisingly intense feelings of anger, rage, and frustration. A sense that one has been betrayed by the people they were supposed to be able to trust the most. Depression and Sadness: prolonged sadness, anxiety, sleeping issues, fatigue, appetite changes, crying, loss of motivation or interest in life, questioning everything, hopelessness, guilt, loneliness, shame, overwhelm. It is common to cope by isolating oneself. Bargaining and Confusion: identity confusion, dissociation, disorganization, reviewing childhood memories, consideration of search and reunion; the search for meaning; reaching out for support; the desire to share ones story. Acceptance: often thought of as the "end goal". One begins to explore forgiveness, compassion, and integration of new information and family members. I like to compare this process to exploring a forest or other natural space. 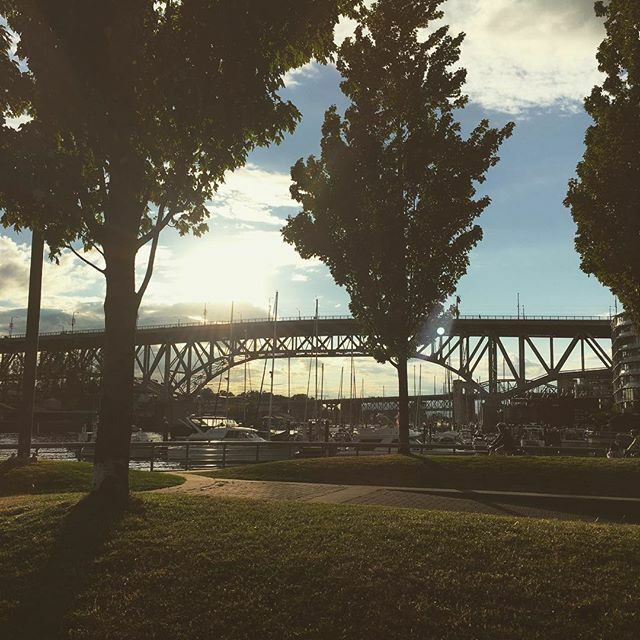 One might wander, revisiting the same stream or walking by the same tree time after time. The key is to keep moving emotionally so as not to get stuck, trusting that we will find our way and that the grief process is a natural part of our humanness. When I first learned my adoption story, it was the week of my 33rd birthday. I recall responding to my mother's words of truth, "your father, is not your biological father" with the words "I know". This is still poignant to me because it speaks to one of my core truths; we know who we are. Deep down, at a core level I had always felt different; I had never "fit in" with my family. This long-term deception cost me my connection with my intuition. I recall asking a half a dozen times as a child "Is dad my 'real' dad?" To which my mom would tell her version of the truth, "Yes, of course he is!" Not a complete lie. He is my dad, and he is "real" after all. He adopted me, and raised me as his daughter, which is the truth I was seeking. What is Expressive Arts? Why is it a useful Resource? The image (left) illustrates some of our right and left brain functions. Our right brain, the center for storing and experiencing our emotions, intuition, and creativity. You may notice that it is also where we store trauma. This is important to note because many people find that when they are processing a life changing event or trauma, it can be difficult to "find the words" to express their experience. Using the arts as a form of communication can support ones in tapping into their unconscious material to express, process, and move towards healing even "without words." Expressive arts can include many mediums: music, dance, drawing, sculpting, painting, collage, sandbox play, singing, writing, collage, mind-mapping, visioning, art journalling, story-telling, dreaming, film and I'm sure there are many more I've not listed. One channels their natural inclination to express and process into a physical object or performance, thus taking the "issue" or "struggle" and putting it "into" something outside of themselves. 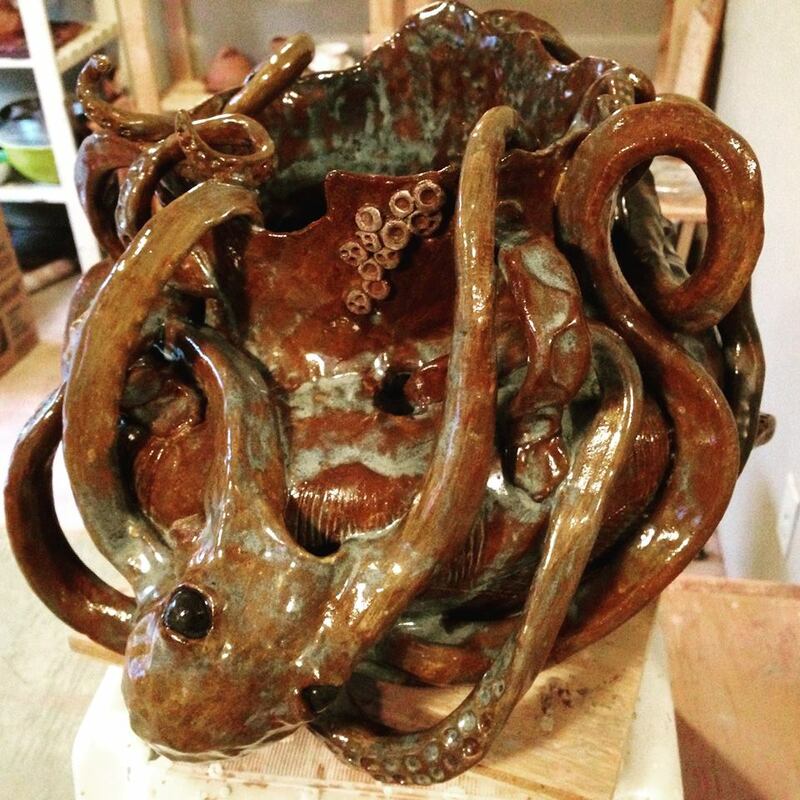 Once a piece has been created, time is spent reflecting on the process of creating it. What was the inspiration? How did the creation take place? What does it mean? Are symbols present, and if so what do they represent? How did one feel while creating? If one chooses to share their process with another, how does it feel to have ones creative process witnessed by another? After reflection, sometimes a person will feel inspired to add an additional media, for example adding text or poetry to a painting, or drumming out how it felt to create and have their creation witnessed. *At other times, the art speaks for itself. It just is, and the creation of it is what helps a person to move forward in their healing. Sometimes, people can feel reluctant about creating, perhaps holding onto insecurities about their artistic ability. Some people immediately recall times when they struggled to get the artistic outcome they desired, and felt their art "fell short" of their vision. When using art as a therapy, one is far less concerned with the final product, the emphasis is on process. When working with clients, I include many project ideas that are process-focused; these are messy, experimental, no-fail projects. Below are some examples of process art I intuitively created while processing my discovery. Certain animals became reoccurring symbols for me. The octopus, a symbol of camouflage, hiding, searching, clinging, self. 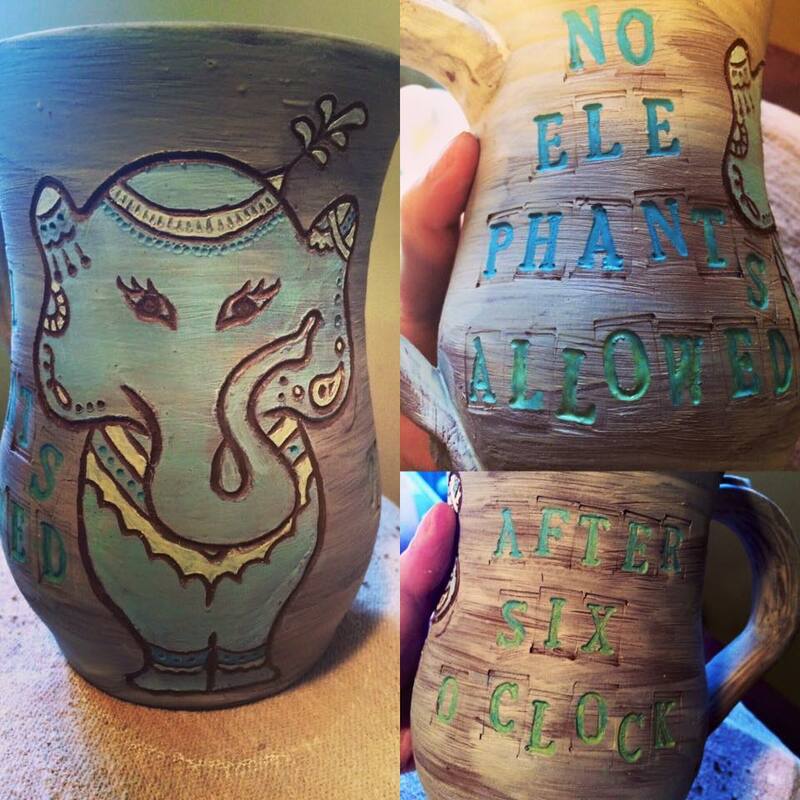 The elephant, a symbol of family, the betrayal and unspoken secrets. The buffalo, a symbol of my own motherhood, compassion, and protection. During the creation of each one, I was processing issues and emotions related to my adoption, betrayal, grief and loss. "Everything has changed and nothing has changed." Create something that represents this common LDA sentiment using any media that speaks to you. *What feels as though it has changed? What does not feel as though it has changed? Create freely and intuitively, with focus on being in the moment rather than the final appearance of the piece. Notice how this process feels in your body.